The final draft SMS chart had 33 items that were pooled into three parameters: pregnancy-related risk factors, physiological variables and biochemical tests. There was 100% agreement on inclusion of the parameters and the cut-off points. Pregnancy-related risk factors were taken from the antenatal card and modified to include the obstetric and medical history. The parameters were given a bicolour coding with a simple yes or no as the potential response. An orange colour denotes the presence of a risk factor and a green colour indicates no risk. Each parameter was given a score of 1. The presence of ≥4 oranges at any time during pregnancy indicates a high-risk pregnancy. Eight physiological parameters were identified [blood pressure, pain, temperature, pulse, respiratory rate, saturation (SpO2), urine output and neurological status of the patient]. A triple colour coding, weightage and score was assigned to each one of them. Of the eight physiological parameters, respiratory rate and conscious level were given a weightage of 2. Other parameters were given a weightage of 1. Eight biochemical parameters were identified; colour coded and scores assigned depending on the severity of derangement [Figure 1] and [Figure 2]. The majority of women (n = 113, 94.16%) were aged 20–34 years with a mean age of 23.5 years. About 81.6% were illiterates (n = 98) and of low socio-economic group (n = 115, 95.8%) [Table 1]. 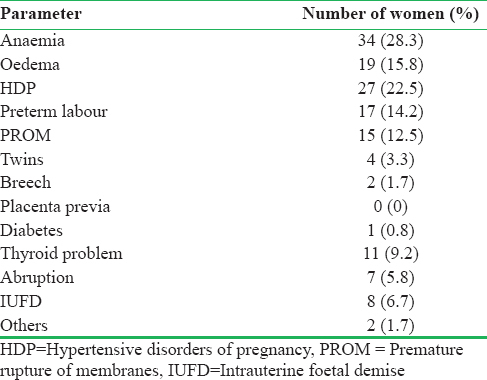 Anaemia was the most common pregnancy-associated risk factor (n = 34, 28.3%), followed by hypertensive disorders of pregnancy (n = 27, 22.5%) [Table 2]. 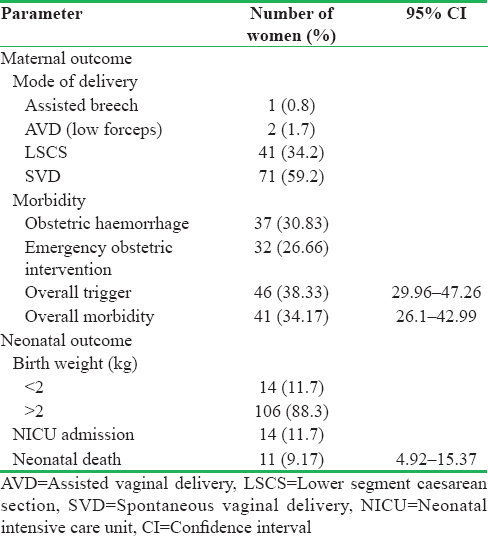 Majority of the women had spontaneous vaginal delivery (n = 71, 59.2%) and the caesarean delivery rate was 34.2% (n = 41). The total number of high-risk pregnancies was 37 (30.83%) and 32 (86.49%) of the 37 women needed urgent obstetric intervention. 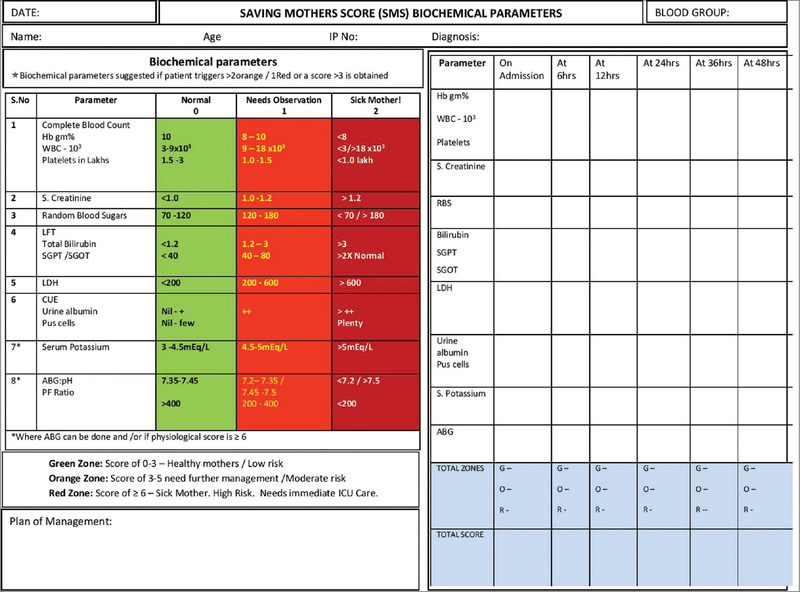 The common obstetric and neonatal outcomes in the study subjects are presented in [Table 3]. Forty-six women (38.33%; 95% CI: 29.96, 47.26) triggered an alarm and 41 (81.93%, 95% CI: 77.54, 95.91) of these 46 women developed morbidity. The diagnostic effectiveness of SMS was comparable to MEOWS [Table 4]. The positive likelihood ratio for overall score was 7.39 (95% CI: 3.27, 16.7) and negative likelihood ratio was 0.48 (95% CI: 0.33, 0.67). The positive likelihood ratio for overall trigger was 45 (95% CI: 6.34, 320) and negative likelihood ratio was 0.40 (95% CI: 0.28, 0.57). The positive likelihood ratio for pregnancy-related risk factors was 5.99 (95% CI: 3.13.11.5) and negative likelihood ratio was 0.36 (95% CI: 0.23, 0.57). The positive likelihood ratio and negative likelihood ratio for physiological parameters score was 4.82 (95% CI: 1.61, 14.4) and 0.80 (95% CI: 0.66, 0.96), respectively. The positive likelihood ratio and negative likelihood ratio for physiological parameters trigger was 46.3 (95% CI: 2.83, 758) and 0.70 (95% CI: 0.57, 0.84), respectively. The positive likelihood ratio and negative likelihood ratio for biochemical parameters score was 43.8 (95% CI: 2.65, 725) and 0.73 (95% CI: 0.61, 0.88), respectively. The positive likelihood ratio and negative likelihood ratio for biochemical parameters trigger was 16.1 (95% CI: 2.13, 122) and 0.79 (95% CI: 0.68, 0.93), respectively. 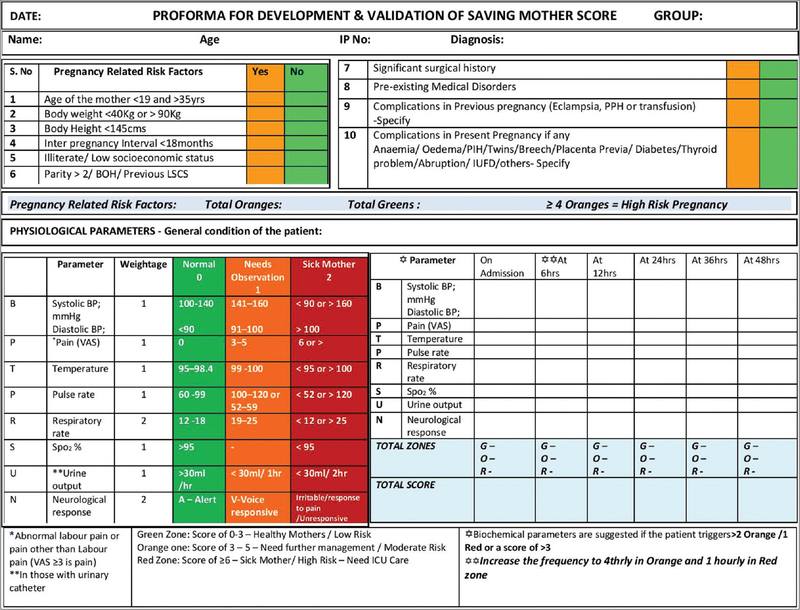 The SMS chart was validated against the existing MEOWS in predicting the maternal morbidity. The sensitivity of MEOWS was 54.6%, specificity 97.8%, PPV 92.5% and NPV was 79.9% when MEOWS was applied for the same parameters as SMS. World Health Organization. World Health Statistics 2016: Monitoring health for the SDGs Sustainable Development Goals. World Health Organization; 2016. Available from: http://www.who.int/iris/handle/10665/206498. [Last accessed on 2018 Apr 04]. Soma-Pillay P, Nelson-Piercy C, Tolppanen H, Mebazaa A. Physiological changes in pregnancy. Cardiovasc J Afr 2016;27:89-94. Al-Foudri H, Kevelighan E, Catling S. CEMACH 2003-5 saving mothers' lives: Lessons for anaesthetists. Contin Educ Anaesth Crit Care Pain 2010;10:81-7. Goldhill DR, White SA, Sumner A. Physiological values and procedures in the 24 h before ICU admission from the ward. Anaesthesia 1999;54:529-34. Adam S, Odell M. An acute problem? A report of the national confidential enquiry into patient outcome and death. Nurs Crit Care 2005;10:225-7. Mitchell IA, McKay H, Van Leuvan C, Berry R, McCutcheon C, Avard B, et al. A prospective controlled trial of the effect of a multi-faceted intervention on early recognition and intervention in deteriorating hospital patients. Resuscitation 2010;81:658-66. Gardner-Thorpe J, Love N, Wrightson J, Walsh S, Keeling N. The value of modified early warning score (MEWS) in surgical in-patients: A prospective observational study. Ann R Coll Surg Engl 2006;88:571-5. Williams B, Alberti G, Ball C, Bell D, Binks R, Durham L. National Early Warning Score (NEWS): Standardising the Assessment of Acute-Illness Severity in the NHS. London: The Royal College of Physicians; 2012. Isaacs RA, Wee MY, Bick DE, Beake S, Sheppard ZA, Thomas S, et al. A national survey of obstetric early warning systems in the United Kingdom: Five years on. Anaesthesia 2014;69:687-92. Gao H, McDonnell A, Harrison DA, Moore T, Adam S, Daly K, et al. Systematic review and evaluation of physiological track and trigger warning systems for identifying at-risk patients on the ward. Intensive Care Med 2007;33:667-79. Mercier FJ, Van de Velde M. Major obstetric hemorrhage. Anesthesiol Clin 2008;26:53-66, vi. Mammaro A, Carrara S, Cavaliere A, Ermito S, Dinatale A, Pappalardo EM, et al. Hypertensive disorders of pregnancy. J Prenat Med 2009;3:1-5. Kinsella SM, Winton AL, Mushambi MC, Ramaswamy K, Swales H, Quinn AC, et al. Failed tracheal intubation during obstetric general anaesthesia: A literature review. Int J Obstet Anesth 2015;24:356-74. Montgomery AL, Ram U, Kumar R, Jha P; Million Death Study Collaborators. Maternal mortality in India: Causes and healthcare service use based on a nationally representative survey. PLoS One 2014;9:e83331. Meah VL, Cockcroft JR, Backx K, Shave R, Stöhr EJ. Cardiac output and related haemodynamics during pregnancy: A series of meta-analyses. Heart 2016;102:518-26. Lalkhen AG, McCluskey A. Clinical tests: Sensitivity and specificity. Contin Educ Anaesth Crit Care Pain 2008;8:221-3. Parikh R, Parikh S, Arun E, Thomas R. Likelihood ratios: Clinical application in day-to-day practice. Indian J Ophthalmol 2009;57:217-21. Sbiti-Rohr D, Kutz A, Christ-Crain M, Thomann R, Zimmerli W, Hoess C, et al. The National Early Warning Score (NEWS) for outcome prediction in emergency department patients with community-acquired pneumonia: Results from a 6-year prospective cohort study. BMJ Open 2016;6:e011021. Kyriacos U, Jelsma J, James M, Jordan S. Monitoring vital signs: Development of a modified early warning scoring (MEWS) system for general wards in a developing country. PLoS One 2014;9:e87073.